BAKERSFIELD, CA. — The rose industry prepares at least three months for one of the biggest days in the flower industry - Valentines Day. 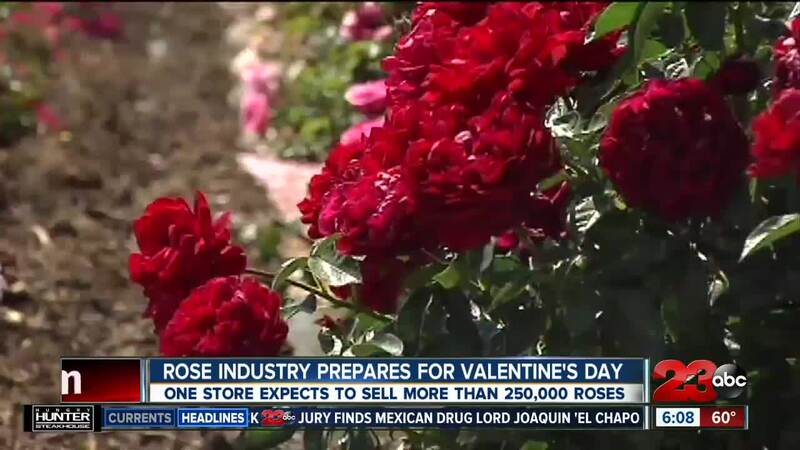 Bakersfield Flower Market says everything is on the line for Valentines Day and quality is essential to a successful sale. "The whole year sales is based on Valentines Day," says Gabriel Kaehler. "This is the largest, biggest holiday and your whole year depends on it." Gabriel Kaehler is a buyer for the market and he says he's one of the biggest flower importers in central California for Leslies Flower Inc. According to Kaehler, the market imports most of their roses from Ecuador. "The only way to get these big head, beautiful roses is to grow them 3000 feet about sea level, so about 2000 feet," said Kaehler. "Pretty much the only place you can grow these is in Ecuador." Unfortunately, Valentines Day falls in the winter months making it almost impossible to source locally. The City of Wasco is known for 40% of the roses grown in the United States. However, a representative from Weeks Roses in Wasco says their roses are considered garden roses, which are much different from the fresh cut flowers used in a flower arrangement. Amanda Barter is a florist at Bakersfield Flower Market and she says there's more than meets the eye into the big day. "When you come in and see those roses that are half as tall as you.. 9 times out of 10 those come from across the world," says Barter. She says there is a science to the perfect quality rose. "When it comes to roses, you want to look for deep color, rich color, a nice large head, a tight spiral in the center, and a thick stem," says Barter.